Fox’s work follows three periods beginning with intimist figures, interiors and landscape images from the mid 1950s until the early 1970s. His early approach, with its interdependence of painting and drawing, relates more to School of Paris painting than a specific Canadian sensibility. 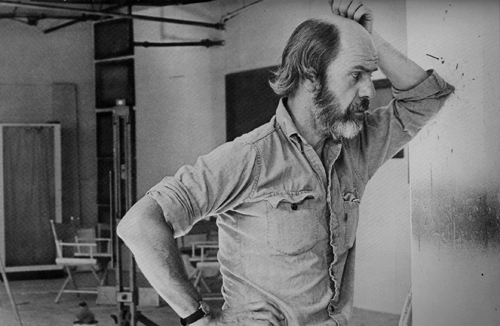 In 1972 and for almost fifteen years, he rejected the imposed limitations of representation by producing large abstract works concerned with the physical and sensuous processes of painting that were influenced by European and American non-figuration. At the same time, he produced a number of collages, which share with the paintings his concern for colour as structure. In 1986, Fox returned to figuration where the tenets of abstraction are represented through a reconstructed reality of people, places and things. His figurative themes suggest the incidents of contemporary life rather than its grand narratives. Throughout his career, he continually drew from the model and his work on paper signifies an important part of his production. Whether his images are abstract or representational, Fox is foremost a colourist where the materiality of colour and light is a metaphor for objectifying the sensations of the subject.